The rapid development of commercial networks this year is easily explained. Salaries Ukrainians grow faster. If the entire 2011 year, they have grown on average by 8.7%, in January-August this year has jumped by 15.3% compared with the same period of the last (data Gosstat). And all this happened against a background of low inflation rates. But how to explain the rapid growth of grocery chains in the midst of the crisis in late 2008? The Fastest growing company was "Eurotech". If at the end of 2008 it consisted of only nine points, but now it has been 69. That is an increase of almost 767%! Keep pace with other companies, as is evident from the graphs. "The market is too saturated" - explains the reason for the growth of Igor Guglya, director of GT Partners Ukraine. According to him, in recent years, retailers have started to actively gain medium and small cities, where there is an acute shortage of modern shops. While there remains a city where there is no network of grocery stores. Moreover, during the crisis, prices for rental properties greatly subsided, and traders it easy to agree on the best places for their stores. Another reason for the rapid growth of networks the inertia of Ukrainian bureaucracy. Plans before the crisis continued to open stores in the crisis, when incomes were reduced (in 2009 wages fell more than 9%). "The opening of new shopping centers - a long-term process, for example, in" METRO Cash & Carry Ukraine "only store building can last up to 3 months, but before construction must still find a building plot just to get all the necessary documents, and etc. 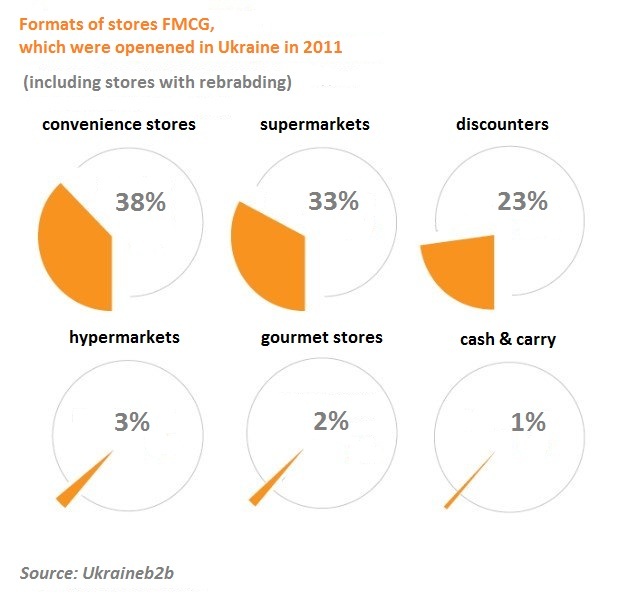 Therefore, to stop the process of expansion at some point for the company does not make economic sense, "- says Anna Kurbatova, Communications Manager" METRO Cash & Carry Ukraine ". But we cannot say that the crisis in general had no effect on traders. Owning retailers had to give up a huge store in favor for more compact stores. Like mushrooms after the rain began to appear small "convenience stores" and discounters with cheap products, but limited selection of goods. "During the crisis, mainly developed network of small formats" - agrees Anna Kurbatova. Its network began in 2011 to develop the small shops to 2 thousand square meters with a range of about three thousand items, called "METRO Base." Before it stores "Metro" in Ukraine existed only in standard area of 16 thousand square meters and with a range of 30 thousand items. Thanks to this new approach, the company managed to open stores in relatively small cities - Kremenchug, Ternopol, Kirovograd and Lutsk. For cities is a great investment, because even in the low-price shop area of about 1 thousand square meters have to invest about $ 1.8-2.7 million (if you buy, not rent a property), explains Igor Guglya from GT Partners Ukraine. The "convenience stores" have less to invest. For example, the network of "Nash Kray" is now developing a network of express minimarkets area of 50-100 square meters. If you rent a room, you can open a new shop even $ 23,000. "In the usual" shop at home "does not have its plants for the production of food (bread, cooking), in contrast to the supermarkets. In each store, our network format "shop at home" BK "Express" has its own mini-bakery, the area allows. Low level of staff, although their level of training above. In small shops seller and cashier and bookkeeper are able to accept products, and put to the position, "- says about the nuances of this business, Dmitry Kashirin, commercial director of "Fudmarket "(included in" Retail Group ", which is developing a network of" Great Kishenya ",TC" Alta Center "," Equator "," Velmart "). Find design ideas for your home on Lushome.club. Opening of the same large size - Hypermarket - associated with the construction of a single building. For this it is necessary to acquire the land and take a lot of coordination, because the volume of investment can range from $ 5 (the most compact hypermarket) to $ 20 million (a huge shop).